You've found the “U.S. 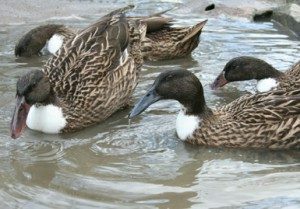 Dutch Hookbill Duck Breeders” page here at Hobby Farm Wisdom! If this is the first time you have visited our site: Welcome! Developed in Holland, the Dutch Hookbill is an ancient breed that finds its origins in Asia. It is set apart from all other breeds by its downward curved beak. They are characterized by their exceptional foraging skills. The Dutch Hookbills duck also great egg layers producing 100-225+ large white or blue green eggs a year. These birds have been bred to become disease resistant, self-sufficient, adaptable and efficient making them a good choice for egg production and small scale farming. They display three bill types: extreme curve, moderate curve and straight. They also have great flight capabilities but always return home. This breed comes in three primary color variations: dusky, white and white bibbed dusky and a few other less common varieties. They are also known to be tame, docile and quiet.